Flying Down to Rio…it’s the classic where Fred Astaire and Ginger Rogers first appeared together. And now you can create your own classic and fly to Rio—Monograms makes it easy! On this 6-day vacation to Rio de Janeiro & Iguassu Falls, we’ve arranged your hotel reservations, daily breakfast, and sightseeing. Plus, in both cities, you’ll have a Monograms Local Host®, someone who will answer questions, offer suggestions, help arrange your activities, translate if you need it, and help make sure your vacation is what you want it to be. We’ve carefully screened and selected the right hotels in the heart of the destination and you can choose your accommodations to match with your style and budget. Welcome to South America’s capital of glamour—Rio de Janeiro! Your Local Host will be available with suggested activities during your free time. Today, a private tour takes you to the Cosme Velho district, where you board a cog-wheel train that will take you through the lush tropical vegetation of Tijuca Forest to the top of CORCOVADO Mountain. This rounded peak rising 2,300 feet from the bay below is one of the new Seven Modern Wonders of the World and home to the iconic statue of Christ the Redeemer. Enjoy a breathtaking 360-degree panorama, which affords sweeping views of the city and beaches below. The afternoon and evening are at leisure. Tonight you may opt to join an outing to a fun churrascaria for a feast of barbecued meats that are marinated and roasted over charcoal in true Brazilian style, followed by a Samba show, where the sheer vitality of this country explodes in a colorful extravaganza. 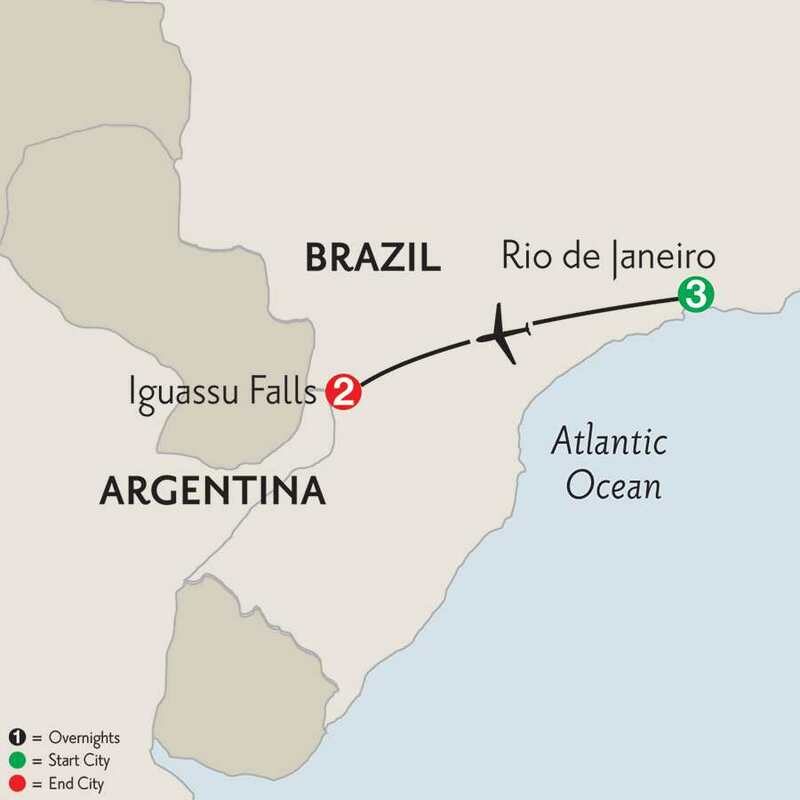 Fly to IGUASSU FALLS at the crossroads of Brazil, Argentina, and Paraguay. This masterpiece of nature encompasses 275 separate falls and spans almost two miles. The afternoon’s private tour is dedicated to enjoying the spectacle of this 2-mile-wide torrential downpour. With some cataracts as high as 250 feet, it’s nothing short of hypnotic. The clouds of spray, the incessant roar, and the surrounding luxuriant tropical growth make this an unforgettable natural wonder. This morning, take the Ecological Jungle TRAIN and tour the Argentine side of IGUASSU FALLS with numerous walkways that wind under the crashing water. The remainder of the day is at your leisure to explore on your own.